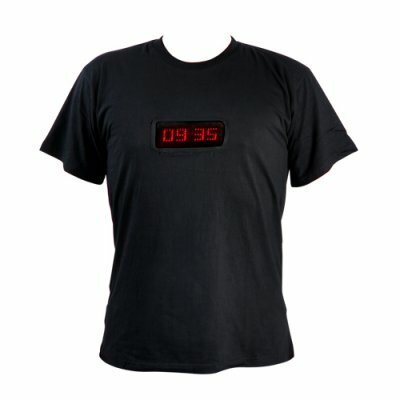 Successfully Added LED Shirt with Time and Programmable Message Display (Large) to your Shopping Cart. LED Shirt with Time and Programmable Message Display giving you the ultimate way to express yourself through words on your T-Shirt: Don't be afraid to show off your inner geek. With this unique LED Shirt, you can display and edit 6 different sentences, logos, mottos or just names of up to 255 characters each! The brightness is adjustable, and the speed and way of displaying words can be chosen among a large choice of pre-registered modes. The use and fun of this awesome LED Shirt is infinite. If you have your own business it is an ingenious opportunity to advertise your company website, special promotions or any other great marketing ideas to attract more customers. Imagine the effect you will generate by sending staff wearing shirts with lively LED messages in crowded areas! Great product, easy enough to set up. Only minus would be the size. Large size is actually more like medium would be great to have it in XL. on 2011-09-21 04:08:58 It's a pity! Great for advertising, pity it has only large size. This will limit sales.